Identification: Greyish brown body with many small white spots above lateral line. Snout narrowly rounded with relatively close set nostrils. First dorsal fin origin slightly anterior to free rear tip of pectoral fins. Pectoral and pelvic fins relatively small. Size: Maximum recorded size: Male 96cm. Female 117cm. Habitat: Mud and sand flats in shallow bays on continental shelf. Distribution: Temperate/tropical Northwestern Pacific Ocean. From Siberia southward to Vietnam including Korea, Japan and mainland China. Isolated records from Kenya probably refer to an as yet undescribed species. Diet: Mostly feeds on demersal invertebrates especially crustaceans. Reproduction: Viviparous without yolk sac placenta. Recorded litter size 1-22, usually 2-6. Population Status: Listed as Data Deficient by the IUCN. However, the starspotted smoothhound sharks is caught in demersal longline and trawl fisheries in the northwest Pacific and likely in other parts of its range, and utilized for human consumption and fish oil (Compagno in prep). It is of considerable importance to coastal fisheries and fishing pressure is high within its known range. Once a common commercial species, that was heavily exploited by coastal trawl fisheries and longliners throughout Taiwanese waters to the point of almost complete disappearance. It is now difficult to find in Taiwanese waters, with the exception of the waters off Chinsham and Kueishan Island, northern Taiwan (Chen et al. 1996). With the expansion of coastal trawl fisheries, Mustelus species have declined in the region, with a noted decline in catch over the past 10-20 years. Species-specific management in this region is problematic due to the multi-species nature of trawl-fisheries (Chen et al. 1996). A decline in catches has also been reported off Kyushu, Japan, and investigation into the extent of these declines is required. Little specific information is available on population trends and catches from elsewhere within the species' range. Photographs: Tateyama, Honshu Island, Japan. Similar species: The starspotted smoothhound is the only smoothhound shark within its range with white spots. 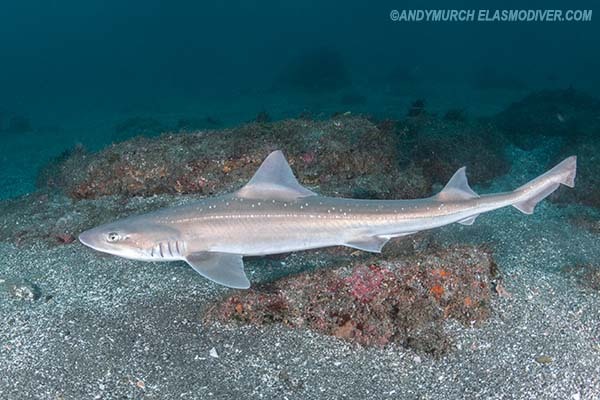 Diving logistics: The starspotted smoothhound is rarely encountered by divers. Please send reports of sightings to Elasmodiver. Tanaka, S. & participants of the IUCN SSG Asia Northwest Pacific Workshop. 2009. Mustelus manazo. The IUCN Red List of Threatened Species 2009: e.T161633A5469162. http://dx.doi.org/10.2305/IUCN.UK.2009-2.RLTS.T161633A5469162.en. Downloaded on 01 December 2017.